Sights for the plainsman rifle follow same rules as for a main match rifle, I believe. * Tang mounted rear sights may utilize changeable peep apertures and eyecups. * No bolt or receiver mounted sight is permitted. * Dovetails may be milled in the barrel for sight replacement. * Beech style front sights and sight hoods are allowed. * Front sights may include a bead or insert of steel, iron, ivory, faux ivory, brass, gold, pewter, copper, or silver. The bead or insert shall be the color of the material. * Rear sights may utilize an insert of the same color as the rear sight to allow easy sight adjustment. * Ramp style front sights are allowed if original to the firearm. * Modern style click adjustable barrel or receiver sights are not allowed. That last item from the list should confirm for you that a click-adjustable barrel sight is not allowed. 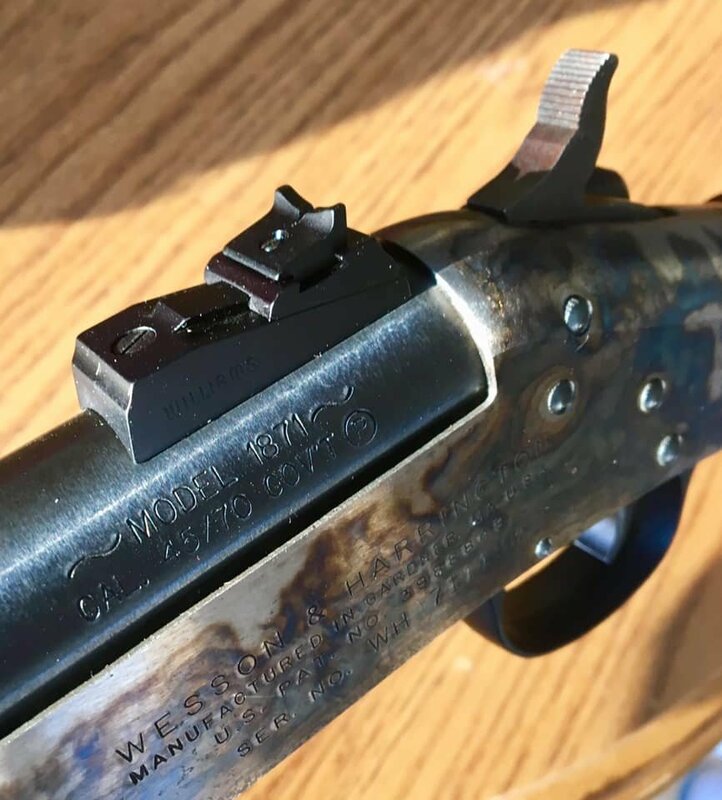 And since peep apertures are called out as legal ONLY for tang-mounted rear sights, that even rules out a fixed peep sight on barrel. No extra allowances for barrel mounted peep sights found there, is there? So, no barrel mounted peeps. 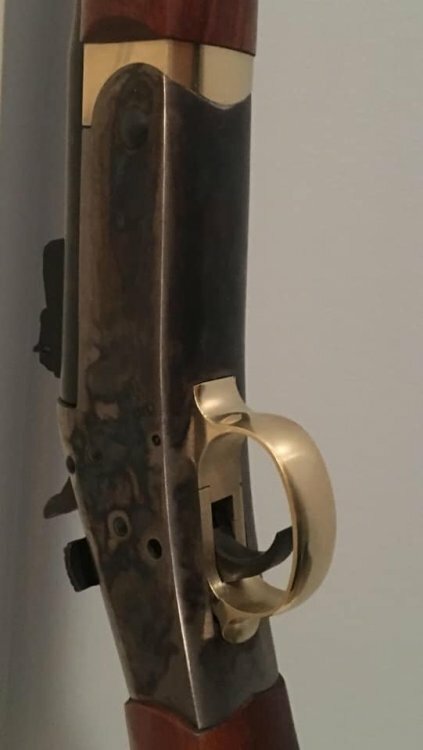 The Plainsman match is eclectic regarding single shot rifles. There are sharps, rolling blocks, trapdoors and buffalo classics. Calibers range fro 50-90 to 38 Special. It's a hoot. 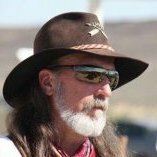 Some say it is more of a social event for black powder shooters than a competitive match. It's a chance to get some old firearms out and have a good time. 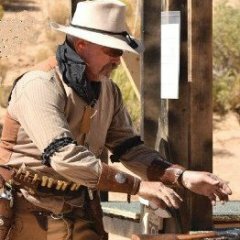 Those who just bought their cap and ball revolvers and did not prep them for competition often quit the match when their revolvers run poorly. The rear sight rules for LR sidematches also apply to "Plainsman"
- Bolt or receiver mounted sights are not allowed. You can replace the peep with a blade and now it is SASS legal. I'd suggest the Smith Enterprises Ladder sight. The sight also includes a mount for Handi Rifle. Brownells. So am I correct in that if a barrel mounted peep isn't mentioned then it is illegal? I don't see any mention on pages 31 or 33 that refer specifically to a barrel mounted peep, only receiver mounted. I may be just being blind however. And don't forget---my last name ends in "ski"
You are correct. A barrel mounted peep is illegal. CC- do you know what model that would be? I just went to Brownell's sight and the only Smith ladder I could find was a dovetail mount for an 1895 type rifle. They are not cheap! Almost the cost of my H&R! In my on line image of the Brownells catalogue, it's on page 10. The sight is titled a Long Range Sight and is shown mounted on a "block." The specs also list it as a "drop on" for an H&R. PS; Forgot ..... the sight ain't cheap. But it is really really good. does this look like the one? Yes - although the part# on the bag did not have the WB on the end of it. Plus - my Handi Rifle needs a taller frt. sight in order to use the Smith sight. Edited March 4 by Yusta B. Replacing both might be a bit pricey. Maybe better to sell & replace. The rifle that is! No experience with N.E. Plainsman rifle targets. Around here, E. Texas, stock open sights on the Handi Rifle hit well out to 75 yds which is plenty good for our shoots. You could just get a Williams or Marble leaf rear sight & play with that for a bit for reasonable cost. I think you're right. That would be the best plan for Plainsman. It's the long range side matches that I think I'm in jeopardy. For this year I may just shoot them as "Just for Fun" and hopefully won't irritate anyone. Still working out how to load light for Plainsman, one thing at a time I guess. I would still need to as you stated---get a buckhorn type for the rear. Stock is a Williams Peep, but not like the one shown above in SD's post. So much to learn, but so much fun. Thanks guys. Thanks to Chili Pepper Pete who turned me onto the sights.